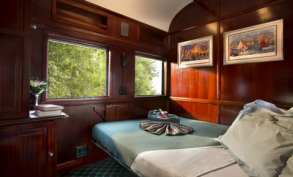 The epitome of luxury, with handsome wood panelling and period Edwardian features, the air-conditioned suites accommodate two people offering the option of twin or spacious double beds. In the en-suite bathrooms, original fittings combine with the modern technology of hot showers, hairdryers and shaver plugs. The very spacious suites offer passengers the opportunity to travel in privacy, comfort and luxury with fittings and facilities that are of the highest standard. 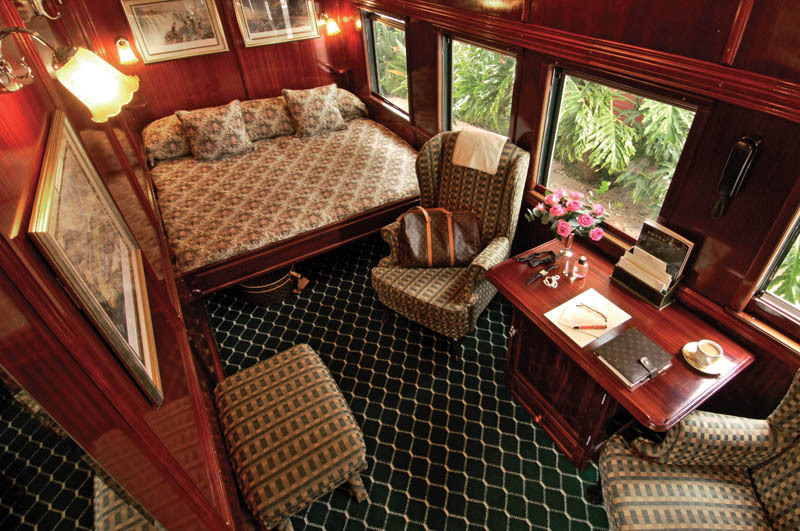 All are equipped with a writing surface and a personal safe for valuables. There is also a bar fridge filled with beverages of the passengers' choice and room service is available 24 hours a day. 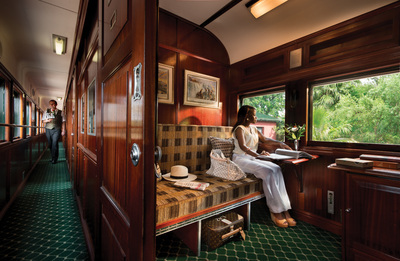 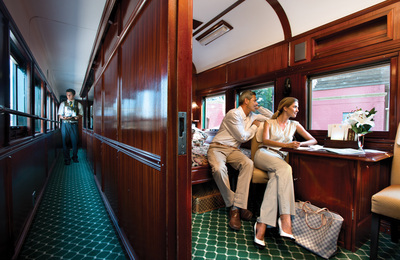 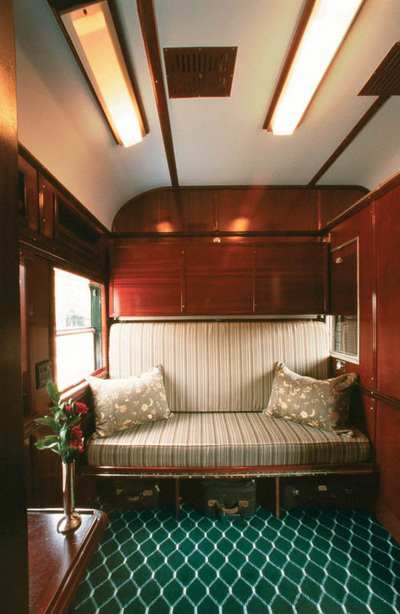 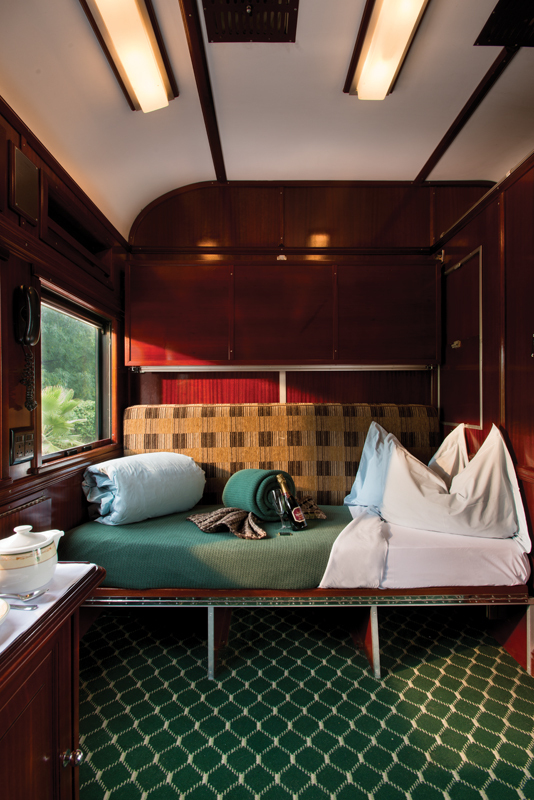 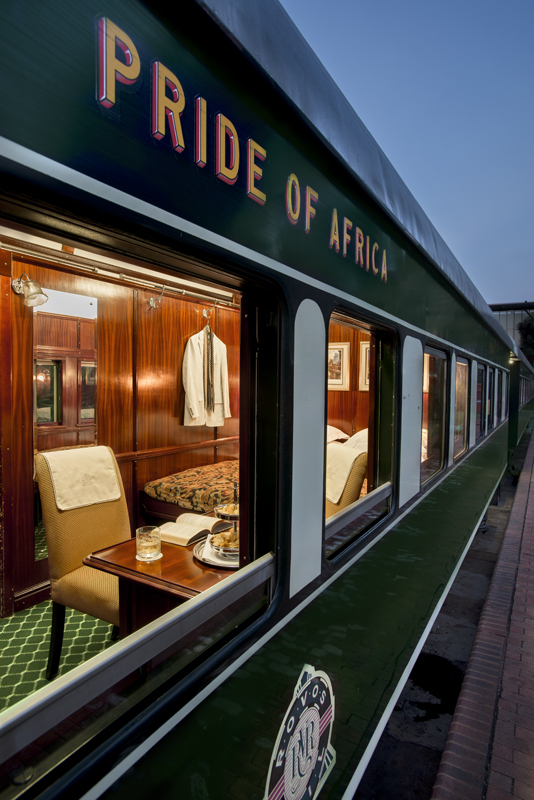 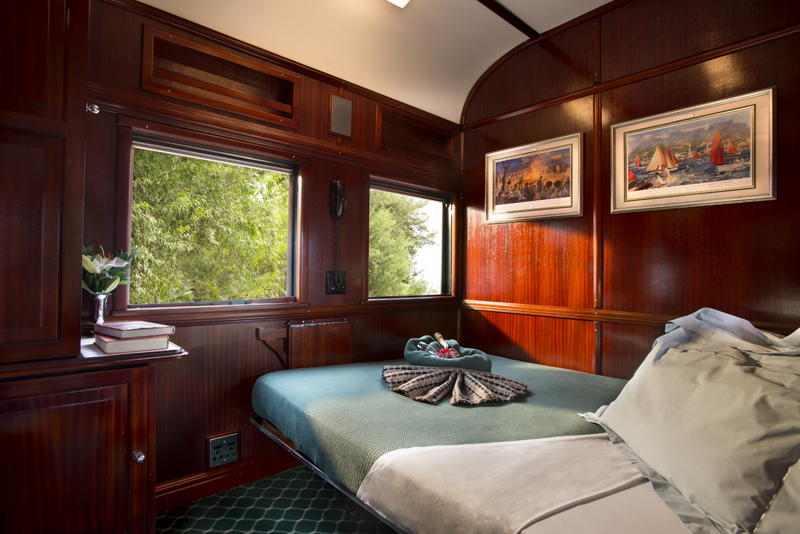 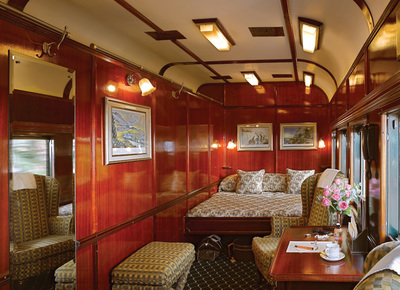 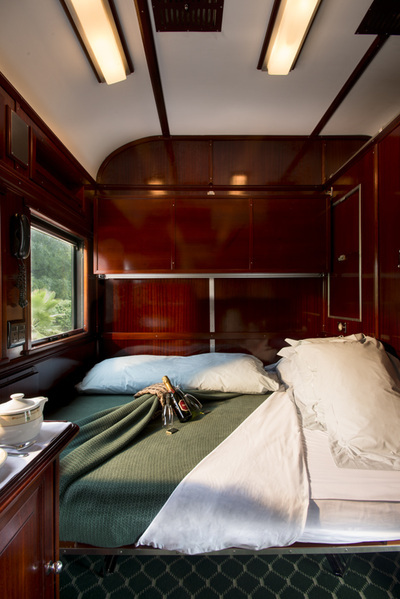 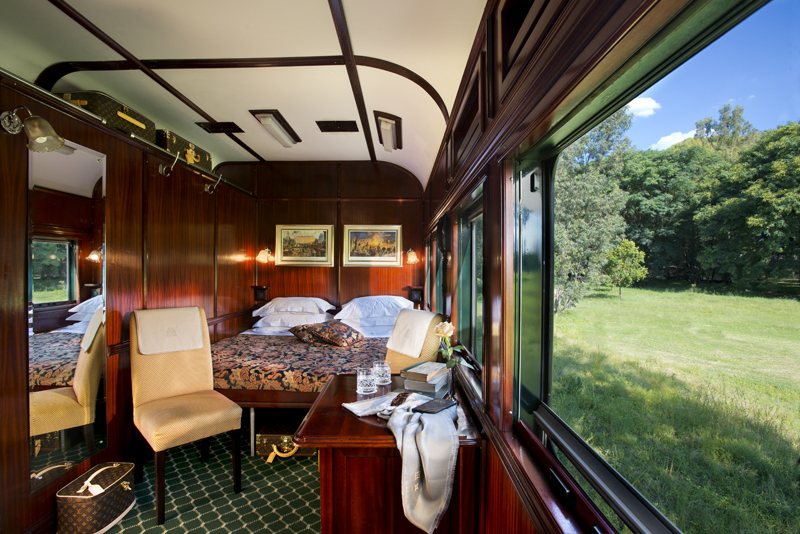 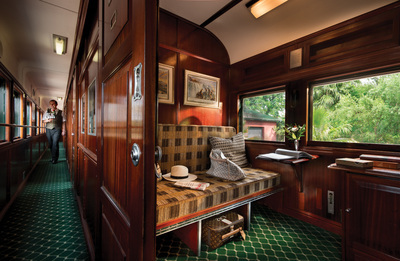 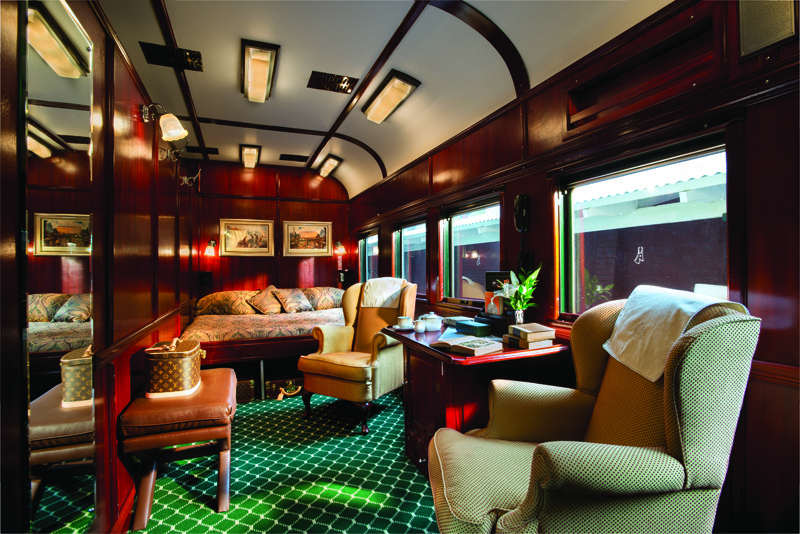 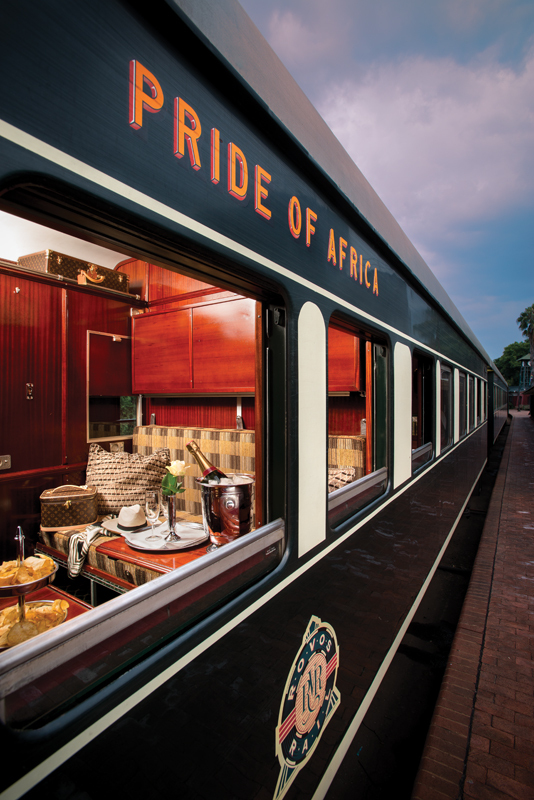 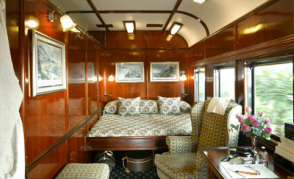 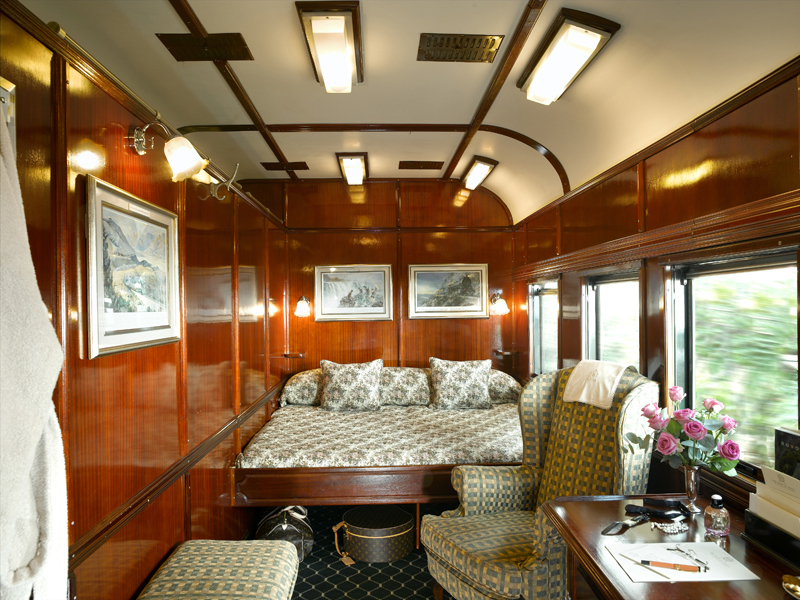 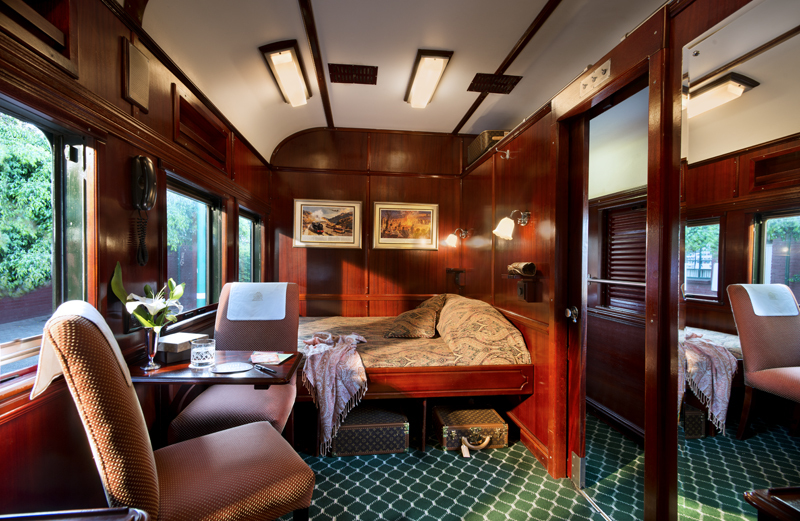 As the name implies, the Royal Suites are the top of the range accommodation, and each suite takes up half a carriage. They are both elegant and spacious, and measure some 16 square metres (173 feet square). Each Suite boasts a private lounge area and full bathroom, complete with Victorian bath and separate shower. 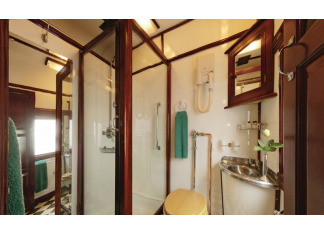 The original fittings combine with the modern technology of hot showers, hair dryers and shaver plugs. 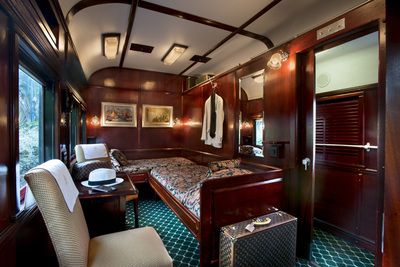 These luxurious air-conditioned Suites, finished with handsome wood panelling and period Edwardian features, accommodate two people, with the choice of side-by-side twin or spacious double beds. 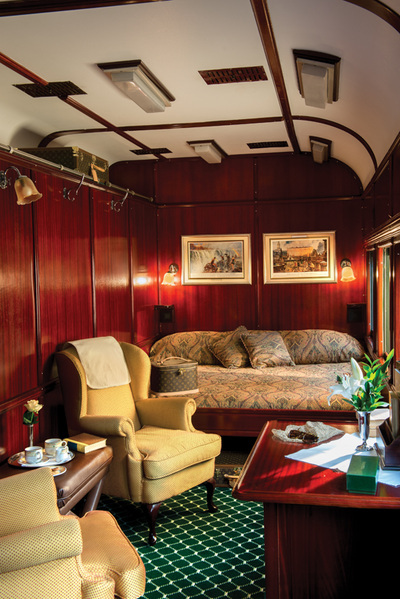 The Royal Suites offer passengers the opportunity to travel in privacy, comfort and luxury, with fittings and facilities that are of the highest standard. 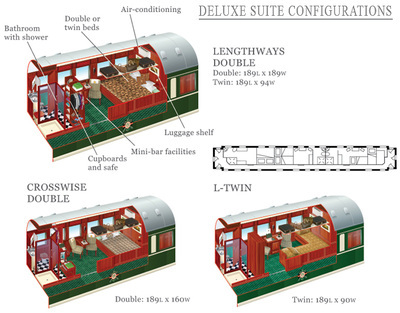 The Deluxe Suites, at some 11 square metres (about 118 feet square) accommodate two passengers in either twin or double beds. 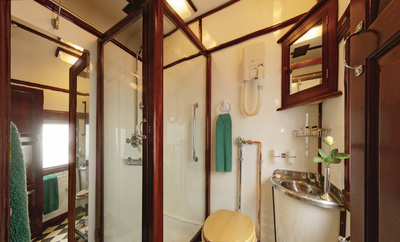 These Suites also have a lounge area and en-suite bathroom, complete with shower. 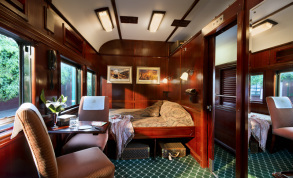 These suites are also wood-panelled but have been completely rebuilt and remodeled – now refurbished to mint condition, they offer every modern convenience and comfort. 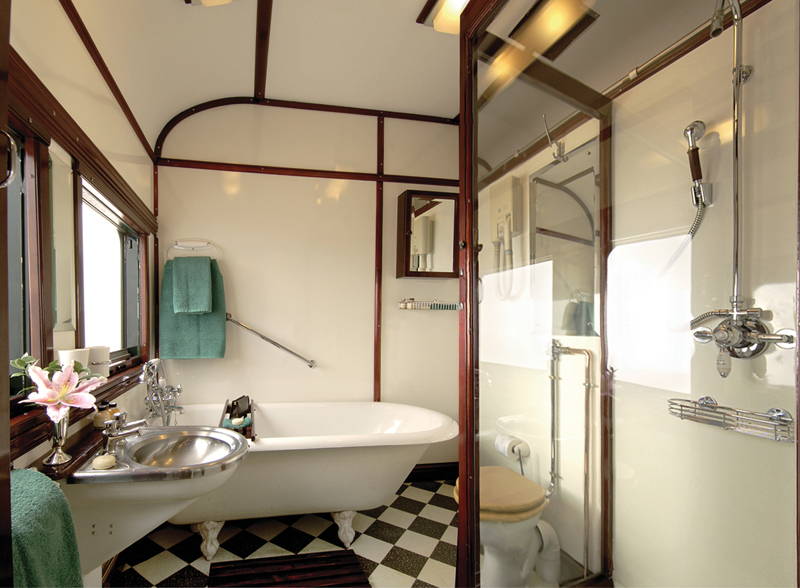 Original fittings combine with the modern technology of hot showers, hair dryers and shaver plugs in the en suite bathroom. The Deluxe suites give you the opportunity to travel in privacy, comfort and luxury, and are complete with fittings and facilities that are of the highest standard. 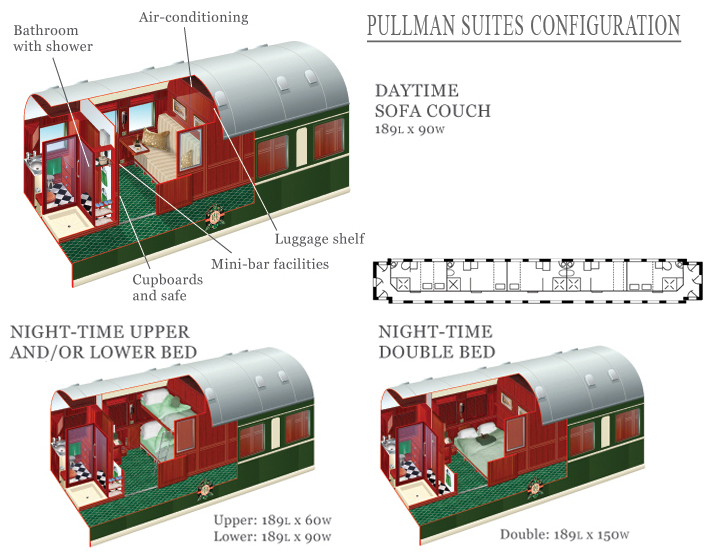 The entry-lever Pullman Suites (at 7 square metres/ about 76 square feet) are equipped with a comfortable sofa-seat for day used, with a conversion to double or twin beds for the evening. Uniquely, the Pullman Suites are also en suite, complete with shower; original fittings combine with modern technology allowing for hot showers, hair dryers and shaver plugs. 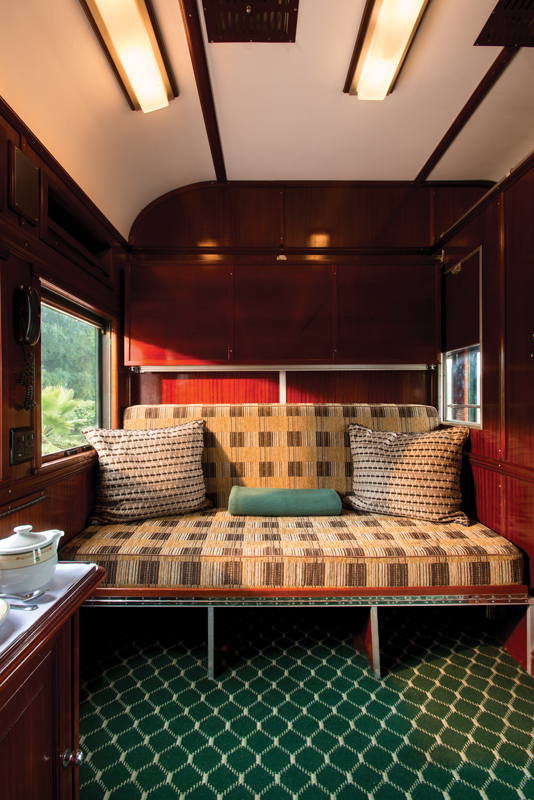 These suites are wood-panelled, refurbished sleeper coaches, and have been completely remodelled and refurbished to mint condition; offering every modern convenience and comfort. 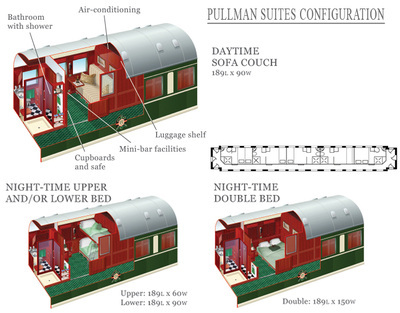 The Pullman Suites allow you to in comfort, luxury, and privacy.